Above is a photo of a black cap chick that I took the other day. It was very overcast and the lighting wasn’t good at all, but I decided to take the shot anyway. It’s very grainy because I had the ISO on my camera set to 800 and the lighting conditions were poor. What I’ll do is hit CTRL-J on my keyboard to make a duplicate layer. It will be called “Layer 1″. Just double click on the word and change it to whatever you’re working on. 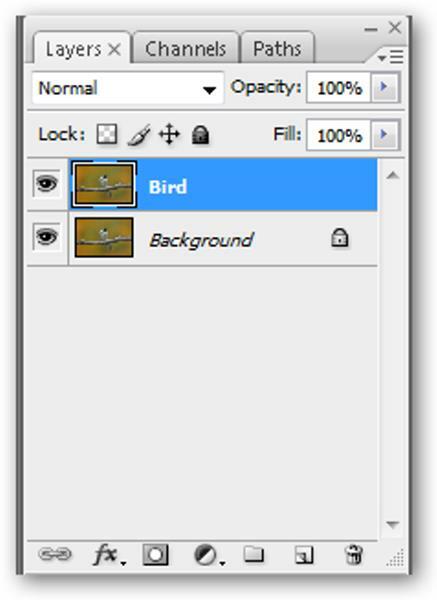 I’m going to call my layer “Bird”. The next thing I’ll do is go to Filter, Blur, Gaussian Blur. 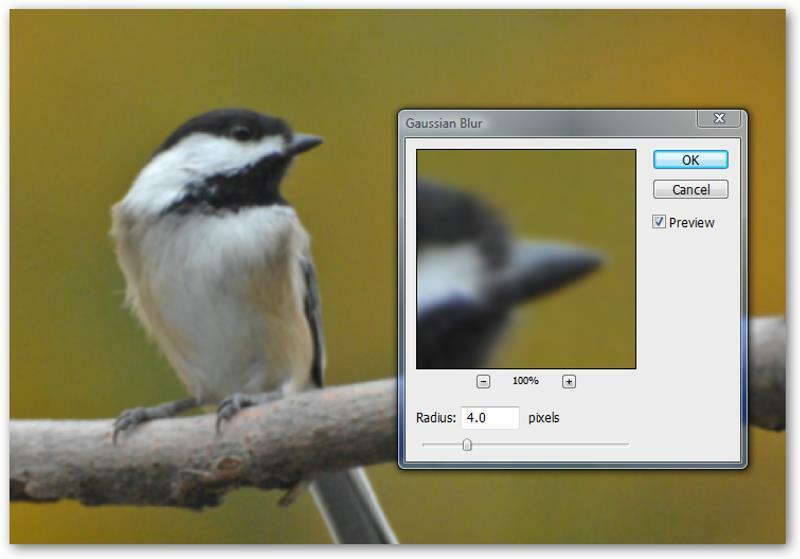 The dialog box for the Gassian Blur will come up. You don’t need to get crazy with the blur, unless you have a lot of distractions in the background. In this case, I just want to get rid of the noise behind the bird where it’s most obvious. 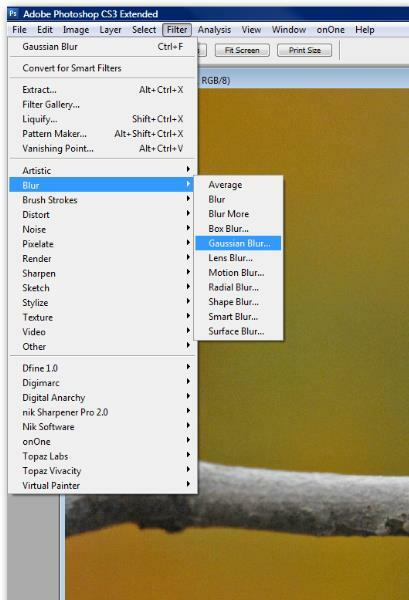 Here I set the blur to 4.0. When you’ve decided how much blur is good for your photo, then click OK. Now it’s time to put a mask on the â€œBirdâ€ layer. Using the mask will make it easier to bring back the sharpness into the bird and still keep the noiseless background untouched. I’ll then click on the mask icon at the bottom of the layers palette. 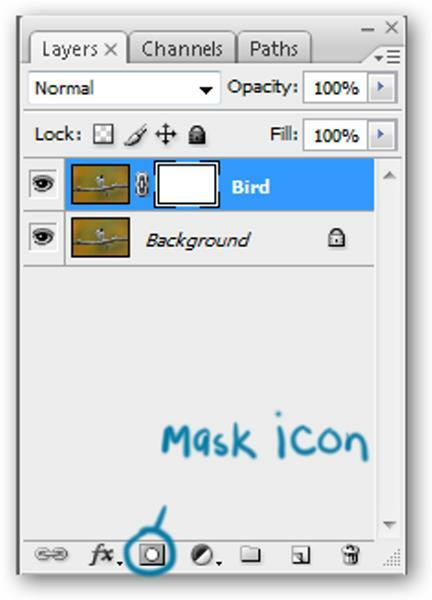 You’ll see the mask box appear in the “Bird” layer. Now all I have to do is paint back the parts of the photo that should be sharp. Make sure that you click on the mask box in the layer to make it active. You’ll see a border go around the small white box when it’s active. I’ll start painting with a black brush to bring out the original image. If you make a mistake and paint the wrong thing, no problem. Switch to the white brush to bring back the blurred layer. Don’t forget you have total control over the brush. You can lower the “Opacity” of the brush while you’re working. Then you can bring back some of the original image. 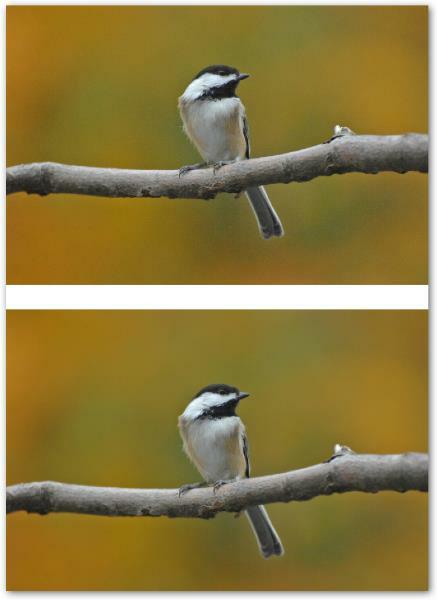 For example, when I brought back the branch the bird is standing on, I used 50% opacity. The main focus is the bird. I don’t want a blurry branch, but at the same time I don’t want the graininess of the branch to pull the viewers eye away from the bird. The opacity brush is located on the tool bar at the top of your screen when you are using the brush. When you are finished you can save the layers as a .psd file, or you can flatten the layer by going to Layer, Flatten Image. Here are the before and after images. You don’t want what you’ve done to be obvious; you want it to be subtle. If you overdo the blur, your photo will looked worked on and you don’t want that. Here I zoomed in closer to the backgrounds so that you can see the difference between the before and after. You can definitely see the difference between the two. 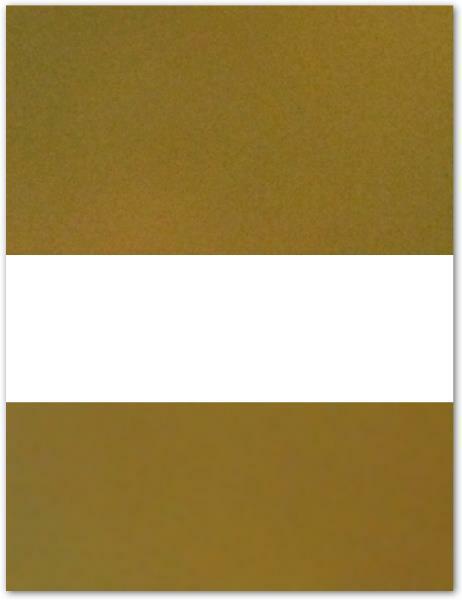 The original photo on the top is very grainy and the fixed one under it isn’t grainy. Try this with some of your photos and see how it works for you. Thanks so much! Everyone else on the internet just says to use the Reduce Noise filter, but that doesn’t work for stuff like this. Again, thanks, worked like a charm. Thank you so much! This helped tremendously! Very nice, helped purple blotches on a landscape photo disappear (I had to have high ISO to cope with twilight) – very clear guidance, one of best on net – thanks! thank u very much.. truly helpful!!!! !